We were pretty excited to visit Nassau on our cruise last month, as we’ve never been to the Bahamas. Keith also loves SCUBA diving so he was hoping he could do that in the short 10 hours we were there. I was hoping to find five family friendly activities in Nassau in those ten hours, but when we pulled up to the dock, I discovered that might not happen. PARTY was the only way to describe what was happening in Nassau at 7:30am. We could hear the music on the main drag all the way over by the dock and there were throngs of people crowding the streets, cheering the floats and drinking. It was 7:30am. And, frankly, it looked like a blast. But we had two kids with us and it was our duty to find kid friendly/family friendly things to do! If you are interested in some power boating, plan in advance. Don’t expect the company to email you back for, say, a week after inquiring. Not saying I have firsthand experience, but….ahem. They are on island time, after all! 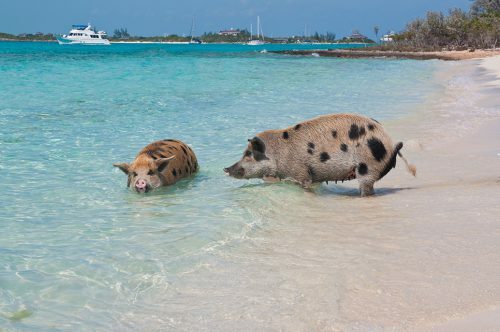 Power boating is a great way to see the Nassau area (some boats even go over to Exumas if you’re interested in seeing the swimming pigs. They have several different group trips and adventures, including stingray feeding, snorkeling, overnight charters and dinner/lunch cruises. The bay around Nassau is really fascinating. During our boat ride, the kids were thrilled to see Michael Jordan’s house, Tiger Wood’s house and Beyonce and Jay-Z’s pad. We even got to see the tiny island used for the Gilligan’s Island TV show opening sequence. The water is beautiful and the sun shines. Who doesn’t love dolphins? I’ve always wanted to pet a dolphin and see one up close and really witness how they interact with people. We chose Dolphin Encounters because we had heard they were a member of the Alliance of Marine Mammal Parks & Aquariums and conducts and supports scientific research with marine mammals. Some “come pet a dolphin” places aren’t known for really taking an interest in the dolphins and don’t treat them well. We didn’t experience this at Dolphin Encounters….in fact, the staff seemed to have a real bond with each of the dolphins and it was nice to see. I watched our guide for a bit after our group had walked away and she was leaning down, hugging “her” dolphin and whispering to him and giggling. She had no idea I was watching. 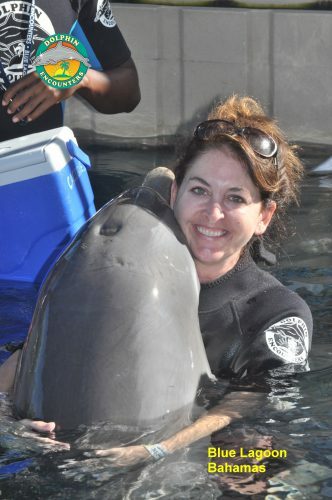 During our tour, we got to pet the dolphins, give them hugs and generally just interact with them. Such friendly creatures who seem so smart. And big! Zoe was terrified but I thought it was a highlight of the trip! 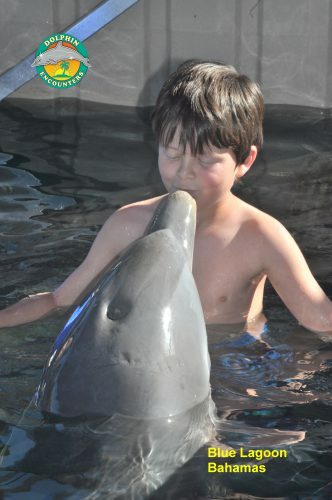 The dolphin experience is in an area of Nassau called Blue Lagoon Island, which has something for all families. Consisting of a calm lagoon area, a beautiful white sand beach, hundreds of palm trees, a grill and a bar, the area is a fun place to rest, relax and play. With tons of kid’s inflatables, hammocks and lounge chairs, the Blue Lagoon charges several different rates for a fun day spent there. We choose the Blue Lagoon Experience, which combined and hour with the dolphins and then the rest of the day on the beach, including a grilled lunch. The kids had a great time swimming in the lagoon and making use of the water toys and Keith and I had a relaxing day sitting under a palm tree. 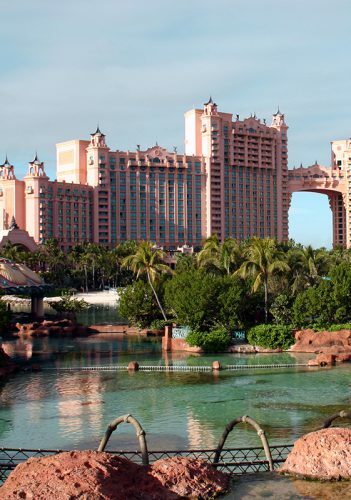 It seems everyone has heard of Aquaventure or, at the very least, Atlantis Resort. Atlantis is huge and extremely popular with tourists. Aquaventure, the water park, as 20 swimming areas, 11 pools including kids pools, water slides and lazy rivers. 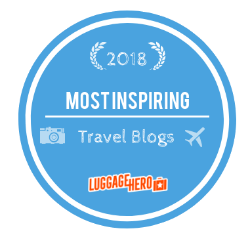 The highlight is the Mayan Temple which includes 5 different water slides, including the Leap of Faith, a 60 foot drop into a clear tube which takes you through a shark filled lagoon. Over the top is the only way to describe Aquaventure at Atlantis. A day pass is easily accessible and includes all the water slides, the lazy rivers and the beach. Adults are $129 for the day and children are $80. Dunmore Town is actually on Harbor Island, but it is easily accessible from Nassau by ferry, which leave every morning at 8am. Dunmore Town is a little known secret that many people don’t know about after hearing so much about Nassau. A quaint little village with gorgeous colonial houses dating from the 18th and 19th centuries, Dunmore Town has plenty of to offer. Interested in SCUBA? Dunmore Town has plenty. The beach? 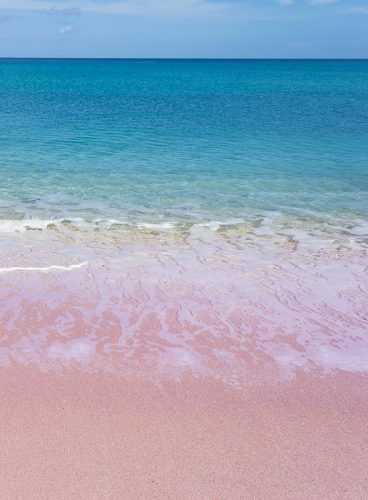 Check out Dunmore Town’s pink sand beach, where the sand is actually pink. There are also art galleries and a cute little town to stroll through. Check out Ma Ruby’s Restaurant, a great local favorite. You did all that in 10 hours? Any one of those seems like you could enjoy it for a day. 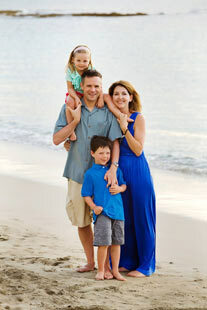 What gret family-friendly vacation ideas for Nassau. I’m especially interested in the pink sand beach. That looks like heaven! I confess we never got to see the pink sand beach. I’m pretty sure I could live on a pink sand beach though.